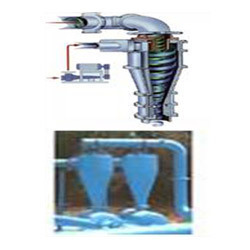 Leading Exporter of centrifugal separation system from Navi Mumbai. Our Organization holds immense experience in manufacturing, supplying and exporting of Centrifugal Separation System. These systems are generally applicable for solid liquid separation with particle size in the range. We also provide Multi-clones for efficient removal of dirt. Our product is widely utilized to reduce the load on the filter and other separation equipments. These products are used singly or in batteries with no moving parts. It works on vortex flow. Looking for Centrifugal Separation System ?